Not sure if it will be one for @OneLessTitan. They will clearly tell us how much it will cost. And no, I haven't started collecting anything yet. I still have limited slots, so I will wait till I can start using them up. If you find speculation fun, here's one projection system based on the first 3 data points shown in the 2 videos NG has posted. 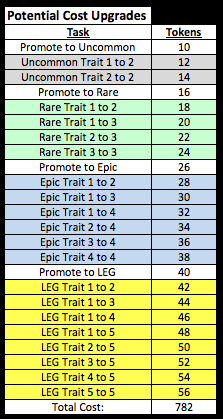 Of course, this will probably be completely wrong, but is based on each successive upgrade costing 2 more tokens as the previous upgrade: Promote to Uncommon was 10 Tokens, upgrading first trait to level 2 cost 12 tokens, and upgrading the 2nd trait to level 2 cost 14 tokens. @OneLessTitan I'm sure you're way underpricing the costs, but nice work none the less. @docfinzenburg - You could be right, but it appeared to me when watching the video that the Common Survivor upgraded to Uncommon had their new Trait unlocked and already started at Level 1. Again, this is all just speculation out of boredom, and I'm not claiming any of this to be accurate.